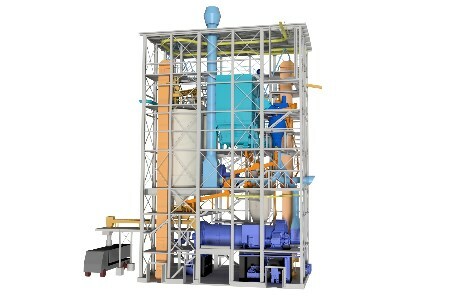 Intercem Engineering has received a semi-turnkey order from Cem’In’Eu for a cement grinding plant with 3.2 m dia. x 10 m EGL ball mill and high-efficiency vertical IVS 62 air separator. The closed circuit ball mill will include two compartments: the first equipped with lifting liners for coarse grinding and the second equipped with a three-stage classifying liner system for sorting with high fine grinding action. An intermediate diaphragm between compartments will allow material flow adjustment to optimise material levels in both sections of the mill. The intermediate and an outlet diaphragm will ensure maximum air ventilations. The mill will have an installed power of 1300 kW. Product collection will be by direct separation by air jet filter at 70 000 m3/hr. Intercem is responsible for plant engineering and documentation, including mechanical, civil, and electrical engineering. In addition, the company will undertake programming works and documentation, mechanical assembly, commissioning, and training. Ground breaking is scheduled for October 2017 with production expected in April 2018.